There’s nothing quite like a cross country flight to allow one to tune everything else out, calmly sit down, turn off the cares and distractions of the world, and plow through a much needed batch of learning and focus. Sure the Internet is wonderful. It’s always on (well, almost always). It’s 100% available (again, almost always). It’s filled with every tantalizing distraction imaginable, and (almost) always there to keep you busy (for some definition of busy). I asked myself “what could I do if I deliberately avoided al of that? What would I focus on? What could I focus on?” The answer is reading. A lot of reading. My blog readers, for better or worse, are going to get a rather large deliverable from that this week, in that I have book reviews to represent. Some of these books are older, some are from unusual places and interests, and one of them was literally handed to me by a friend with the comment “I think you need this”… and to which I would say “that friend was absolutely right”, but more on that in another post ;). 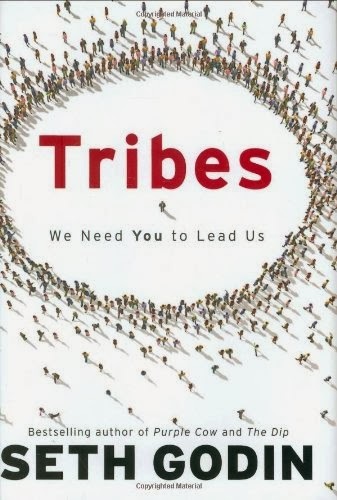 First out of the gate is Seth Godin’s “Tribes”. The subtitle of the book handily describes the purpose and point of this title: “We Need You To Lead Us”. For those who are fans of Godin, you already know what to expect, so I’ll make a quick, terse summary that seems to come up with every Godin book. It’s quick, it’s rambling, it’s all over the map, it’s passionate, and it is bedevilingly void of specifics (and yes, I realize that I just totally made up a word there, but work with me here). Now, with the most obvious of details out of the way, let’s get into what makes this fast read really valuable. Seth is drawing a line in the sand and asking us, all of us, to take up the mantle of leadership. Don’t wait to have it bestowed, steal the throne for yourself. How? Create your own tribe, and have others follow you. That’s it. In a nutshell, that’s the very simple message of the book. Of course, simple should never be equated automatically with easy, and in this case, being a genuine leader and creating a meaningful and devoted tribe, while simple, is definitely not easy. It takes time, commitment, passion, determination, expertise, skill, desire, devotion and most important of all, faith. Tribes shares many vignettes of individuals that bucked the trend and changed the world. Some of the trend buckers are famous (Jobs, 37 Signals, Nike) and many of them are people that most of us have never heard of. Their stories are still poignant, and the essence of who they are and what they do rings clear to the primary message of the book. Take an idea, work with it, believe in it, and seek others to help champion it. So simple, and so direct. Yet amazingly, so few people ever actually follow through with it, because there is risk, there is a chance of criticism, and frankly, it takes sustained passion and belief that you will prevail where others have not. It’s a risky doctrine… but it’s also an extremely fun doctrine! The key takeaway (and one that Set puts into other books, and I think is the central theme of his overall message) is that the “tried and true” of olden days is getting pummeled in a world where large established factories and processes are quickly becoming disrupted and obsoleted. Ten years ago, to publish a book, you needed a publisher willing to take a risk on your book. Today, Leanpub and Lulu (and other organizations) make it possible for anyone to write or publish). In that kind of a word, what sustains and grows is not the tried and true, just for the virtue of it being tried and true, but the remarkable, the unique, the interesting, and the desirable. Is everyone going to come up with the “next great idea”? Probably not, but all of us have good ideas, and many of those ideas do not require a major investment or system to enact. Leadership isn’t necessarily creating a startup and becoming rich (though that is certainly fun and awesome when it happens). Leadership can be based in your own group, and being willing to try a new technique or approach, or even trimming away wasteful processes that are slowing a team down. It could be a blogger who writes about an industry that they are passionate about, and how they hope to make changes in that industry. What stands in the way? Mostly fear. Fear of being branded a heretic. Fear of upsetting the status quo. Fear of being criticized, or laughed at, or mocked. They could possibly be fired, or ostracized, or “burned at the stake” (hopefully metaphorically, though yes, there was a time when that was a real fate for “heretics”). Those fears are all real. They could happen. Seth makes a compelling point that they likely will not, and that the simple fact is that we are being surrounded by heretics, because the cost of being one is going way down in our modern world. With that in mind, why not be a heretic? Be a leader, exhibit some faith, and take that leap. Not only will you likely not suffer slings and arrows, you may just inspire many others to follow your lead, and you may encourage them to do likewise. This isn’t a long book. It’s not a thorough book. It doesn’t have a lot of specifics. It doesn’t have a lot of examples. It makes the maddening point that there is no map to follow, but if you have some passion, some drive, an idea or two, and a belief that they will come to fruition, the odds of you finding people willing to help you push that idea forward, by forming a tribe around that idea, is pretty high. It’s also likely to be small at first. It may may always remain small, and that is totally OK. In fact, most of us belong to hundreds, if not thousands, of tribes at any given time. In many of those tribes, we are followers. In many of them, we are leaders. The most likely thing is that those of us who are leaders of tribes don’t realize it. Seth gives us some motivation to help figure that out, and then do something with it. For that, I think Tribes succeeds.